Of Portuguese descent, Noël is based in Daman (Damão), a former Portuguese enclave on the western shores of India. Founder of “Dia de Damão”, the town’s biggest folk festival, he literally sings praises of its Portuguese cultural heritage by covering top contemporary Portuguese artists. Noël soon found out that being multi-talented can sometimes create dissonance in one’s life, as it did in his – he couldn’t focus long enough on songwriting before the call of the stage would lure him away. And the romantic that he’s always been, he married the two and has lived happily ever since – as a Singer/Songwriter. Though a bilingual singer, Noël sings exclusively in his mother tongue – Portuguese. He’s known to bring tears to his audience’s eyes as he mitigates their ‘Saudades’ with his sweet and soothing voice. His classy and engaging solo performances is a heady mix of contemporary and traditional Portuguese songs, suitable for welcoming visiting dignitaries, at consulates of Portuguese-speaking countries, at cultural and cross-cultural events and at universities and colleges where Portuguese is taught as a language. 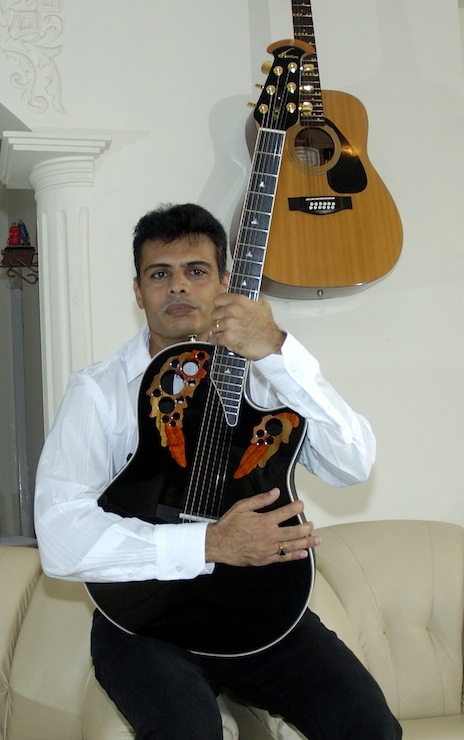 Of all the places Noël’s played, he cherishes most the invitation to perform solo at the Embassy of Portugal (India) and on RDPi.While Noël’s primary instrument is the guitar, he’s just as adept at making creative use of Intelligent Arranger keyboards and modules and a plethora of vocal harmonizers and processors. A plugged-in acoustic guitar and mic are the only instruments used in small, intimate settings. Larger shows and venues however, call for a midi guitar plugged into intelligent accompaniment arrangers and vocal harmony processors. What does he sound like? Very much like his idol, Tony Carreira! When asked about the two dots on the ‘ë’ in Noël Gama, he says, “Oh! They’re just subtle identity markers that I use to let my audience know that I’m a guy every time they hear my rather high-pitched voice – not that it really matters!” he laughs.